A prominent example of the role computational predictions play in everyday life is that of the weather forecast – will the weather allow your outdoor activities, and how about the weather during holidays? A similar situation is faced by plants in their decision when to start flowering: they should take information from the environment into account, in other words, they should forecast the weather. From a scientific point of view, there is a second layer of “forecasting” related to flowering: how do changes in the climate influence the choices made by plants? On-going interest in assessing the impact of global warming is clear – note that in a couple of days (end of September) the next Intergovernmental Panel on Climate Change (IPCC) Assessment Report is due. Recently, a novel approach towards forecasting the influence of temperature on flowering was published (Satake et al. 2013). Before discussing this paper, I will briefly describe a bit of context. A popular approach to model the influence of the environment on flowering has been to use information about e.g. average temperatures and/or the number of days with temperature above a certain level, to find thresholds after which flowering would start. In the last few years, molecular and mechanistic aspects have been introduced to such approaches. In one example, mutants impaired in different signalling pathways in Arabidopsis thaliana were grown in field experiments (Wilczek et al. 2009). A variant of the above mentioned modelling approach was used, in which the accumulation of appropriately scaled “photothermal units” describes the progression of plants towards the initiation of reproductive growth. In this variant, individual scaling factors were linked to the activities of specific genes. In this way, each genotype accumulated photothermal units on the basis of day lengths and temperature averages in each experimental planting, modified according to the environmental sensitivity of the line. A second example presented a two-year census of the expression of a temperature-dependent flowering-time gene, AhgFLC, in a natural population of perennial Arabidopsis halleri (Aikawa et al. 2010). This revealed that the regulatory system in which this gene is involved, extracts seasonal cues as if it memorizes temperatures over the past six weeks. 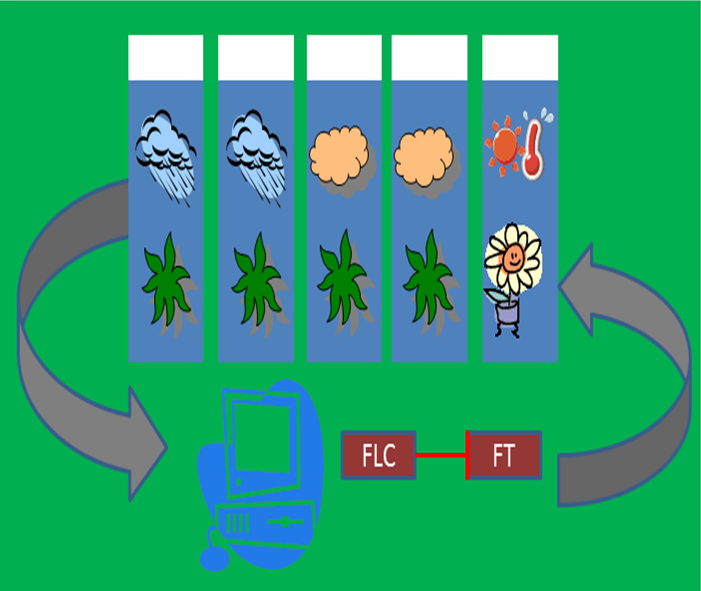 Flowering forecast – information about the weather (left-hand arrow) is taken into account in a computational model of a gene regulatory network (bottom panel); this in turn predicts flowering time (right-hand arrow).FLC and FT indicate the two genes modelled by Satake et al. ; red arrow indicates repression activity. Now, a follow-up on this work forecasts flowering phenology under the influence of temperature changes, again for Arabidopsis halleri (Satake et al. 2013). This time, not only the influence of the environment was included, but also a mechanistic model of a gene regulatory network that influences flowering time. The parameters describing the interactions in this network were fitted to data obtained in controlled experiments in the lab. Importantly, this was done separately for different natural populations. The resulting sets of parameters capture differences in how these populations respond to temperature change, as mediated by the gene regulatory network. Subsequently, these models were tested by predicting how these populations would respond to temperature conditions measured in the field, where the models show a convincing ability to predict flowering. One striking so far untested prediction of the model is that it forecasts that under climate warming, the shift in the return time to vegetative growth is greater than that in floral initiation. This would correspond to a significant reduction of the flowering period and ultimately to losing the opportunity to flower at all. From a computational point of view, it is interesting that the parameters of the gene regulatory network model presented by Satake et al. capture information about responses to the environment, and how these responses differ between natural populations. This extends recent efforts towards modelling flowering time gene regulatory networks, such as (Dong et al. 2012 and Jaeger et al. 2013). Nevertheless, genetic information is not yet explicitly present in the Satake et al. model, in the sense that no connection is made to causal variants in the genome that presumably are present in the different natural populations. Hence, for a novel population of interest, this approach is not directly able to predict its behaviour based on genetic information. I expect that we will see in the near future modelling approaches that use such knowledge on which genetic changes underlie differences between populations. One recent example of an underlying causal variant for Arabidopsis thaliana is given by (Méndez-Vigo et al. 2013) and such information could in principle be incorporated as influencing the parameters in the model. That being said, this work provides an important step towards describing how plants deal with the weather forecast! Satake A, Kawagoe T, Saburi Y, Chiba Y, Sakurai G, Kudoh H. 2013. Forecasting flowering phenology under climate warming by modelling the regulatory dynamics of flowering-time genes. Nat Commun 4:2303. Wilczek AM, Roe JL, Knapp MC, Cooper MD, Lopez-Gallego C, Martin LJ, Muir CD, Sim S, Walker A, Anderson J, Egan JF, Moyers BT, Petipas R, Giakountis A, Charbit E, Coupland G, Welch SM, Schmitt J. 2009. Effects of genetic perturbation on seasonal life history plasticity. Science 323(5916):930-4. Aikawa S, Kobayashi MJ, Satake A, Shimizu KK, Kudoh H. 2010. Robust control of theseasonal expression of the Arabidopsis FLC gene in a fluctuating environment. Proceedings of the National Academy of Sciences 107(25):11632-7. Dong Z, Danilevskaya O, Abadie T, Messina C, Coles N, Cooper M. 2012. A gene regulatory network model for floral transition of the shoot apex in maize and its dynamic modelling. PLoS One 7(8):e43450. Jaeger KE, Pullen N, Lamzin S, Morris RJ, Wigge PA. 2013. Interlocking feedback loops govern the dynamic behavior of the floral transition in Arabidopsis. Plant Cell 25(3):820-33. Méndez-Vigo B, Martínez-Zapater JM, Alonso-Blanco C. 2013. The flowering repressor SVP underlies a novel Arabidopsis thaliana QTL interacting with the genetic background. PLoS Genet 9(1):e1003289. This entry was posted in flowering, flowering time, Uncategorized and tagged Aalt-Jan van Dijk, environment, Flowering, forecast, gene regulatory networks, modelling, phenology, photothermal units. Bookmark the permalink.